Move Over Bumper…The Growler is Here! Before Prohibition in this country, it was common that urban dwellers would buy beer by the bucket, and take it home. With the explosion of micro-brewerys in many areas, the ability to buy beer straight from the brewery has once again become a fairly common fixture, leading to the development of the beer “growler”. 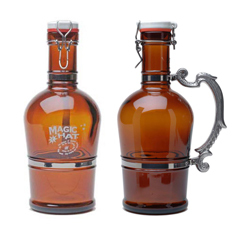 A growler is a bottle or jug which can be filled at the local brew pub for consumption at home. They come in various sizes including 32 oz, 64 oz, and 128 oz.And they can be as basic as a “brown jug”, or fancy with carrying handles or made out of ceramic. David Wescott has two 32-ounce growlers he brings into Proof Brewing Company to fill up and take home. Why two? Because Florida is one of only three states where it’s illegal to fill one 64-ounce beer container, known as a growler. He can get as many of the 32-ounce containers filled as he wants, and Florida breweries can also fill unlimited 128-ounce growlers for customers to take home. But the size preferred by most beer enthusiasts is banned. Two lawmakers have filed bills to legalize the half-gallon jugs, but a group of beer distributors is fighting both measures and appears to have helped effectively kill both for the year. Never been much of a beer drinker – but the patchwork of the country’s liquor laws are amazing. I live in a state where there are still “dry” counties, and where the sale of “hard” liquor is confined to State owned stores. What I mean is anybody can buy a hundred guns at a time in my state, and the Republican Governor recently overturned legislation limiting gun purchases to one a month. But… Despite vociferous campaign promises we still haven’t privatized the sale of liquor in the state… Or normalized the law in all of the State’s counties. How come you can regulate beer in this country… But you can’t regulate guns?